Doug honoured with special Starburst award. 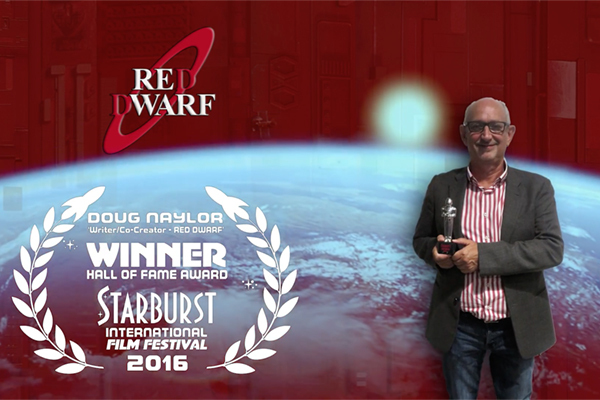 At the Starburst Film Festival in Manchester last weekend, a special early screening of Red Dwarf XI was followed up by an even more special ceremony: as our very own Doug Naylor was honoured at the 2016 Starburst Fantasy Awards with a special Lifetime Achievement Award. 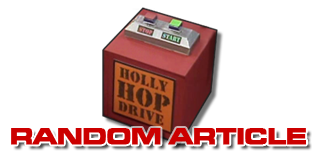 The award was in recognition of the Red Dwarf co-creator's contribution to the genre and cult entertainment, and saw him inaugurated into the Starburst Science Fiction Hall of Fame. Not that the day went off entirely without a hitch. "A bomb scare postponed the award ceremony by an hour," Doug explains. "An unclaimed black suitcase had been found. Everyone piled out, and hundreds stood on the streets while the bomb squad arrived. Someone wondered if they would send in a robot, and I cursed my luck that I hadn't brought one of the skutters - I'd happily have seen one of them blow up in the name of justice. After 30 minutes or so it was discovered that the unclaimed mysterious black case belonged, and I quote, to 'the Starship Enterprise people' and contained some consoles and Andorran duelling weapons." Starburst is the world's longest-running sci-fi and cult entertainment magazine, having been founded back in 1977 - and these awards, which are voted on by a select panel of industry professionals, date all the way back to 1980. 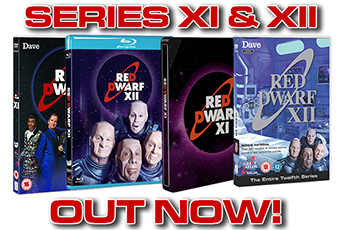 It's unsurprising, then, that the magazine's path has crossed with Red Dwarf's several times in the past - nor that Doug himself has long been a reader. "In my acceptance speech, I thanked Craig, Chris, Dan and Bobby and all the great crews past and present. I also thanked Rob for his contribution to the first six series. I then went on to tell the story of how I always used to buy Starburst - well, actually, I usually just stood in WHSmiths and read it from cover to cover. 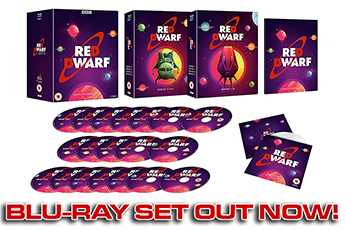 I only actually bought it if there was a good review of Red Dwarf in it, so I didn't actually own many copies. I remembered RDIII got a terrible review: they said it was 'no longer funny'. I said giving me a Lifetime Achievement Award and putting me in the Hall of Fame was the least they could do after a review like that!" Our heartiest congratulations go to Doug for winning this award, which should sit nicely on the mantelpiece alongside that Emmy, the British Comedy Awards and the RTS Craft and Design from previous years. "The award itself is a statue of Klaatu from The Day the Earth Stood Still. And it's very heavy." Check out this in-depth interview Starburst held with Doug in 2012!